Alice Scott is used to cooking basic sugar free meals as her husband is diabetic. But when her parents, brothers and sisters and their partners were all coming over to celebrate his 40th birthday, she had to put together something that was really quite special. Alice said:“My husband Ben was diagnosed as diabetic four years ago and since then has avoided sugar wherever he can. To be honest, he was never a huge lover of sweet dishes or snacks anyway, so it hasn’t been a major problem. He now eats much more healthily than he ever did and as a result has lost a great deal of weight. “I was also used to the idea of planning meals for a diabetic as my father was diagnosed with the illness some 10 years or so ago. Both my husband and father have decided to cope with their condition by cutting sugar out all together, rather than to try to keep tabs on just how much they have eaten. Neither is also very keen on diabetic foods that use artificial sweeteners. They might have a square of very dark chocolate or two every so often – or a small egg at Easter – but mostly they prefer to eat fresh fruit for pudding. “When my whole family decided to come over to celebrate Ben’s 40th birthday, however, I decided I would make an attempt to create a sugar free culinary spread. The starter and the main course would be easy, but I knew I would have to be creative with the dessert, which I wasn’t really used to making. “We began our meal with a home-made wild mushroom soup. This contained wild mushrooms, shallots, vegetable stock, fresh cream and seasoning. I served it with home-made, wholemeal bread, which is ideal for diabetics as it’s good for them to have lots of fibre. “We then went on to the main course. Here I made two dishes – one for the vegetarians and another for the meat-eaters. For the herbivores, I made an aubergine parmigiana di melanzaneand for the carnivores, grilled tender loin with a spicy apricot dressing, served with fresh asparagus. “Because I’d done two main dishes, I also decided to cook two sugar free desserts. So far, leaving the sugar out had not been an issue as none of the dishes had included it anyway. “A dinner party is not a dinner party in my opinion without a chocolate 'something' so I opted to make a rich chocolate brownie dessert as one of the dishes. The other was to be a fresh strawberry cheesecake. 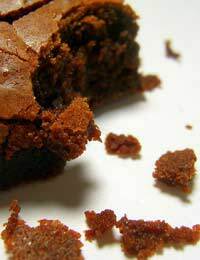 “For the chocolate brownie dessert, I basically found a standard recipe and substituted the golden syrup and sugar content for sugar free jam. This is a brilliant ingredient that I’ve used before when making a birthday cake for Ben, it is sweetened naturally with fruit juice but works very well in cooking. Diabetics shouldn’t have too much of it but a little in a portion of dessert is fine once in a while. “I actually used the same sweetener in my baked strawberry cheesecake. The topping was made from cream cheese, fresh strawberries, eggs and sugar free strawberry jam, all blended together. I then spread it onto a base made from honey, wholemeal flour and cinnamon, and baked it. Both puddings were served with fresh whipped cream and a pile of quartered strawberries. “I finished off the dinner party with coffee and bitter chocolate fancies. These were a kind of rich truffle, which were made from a paste that included just a little honey, cocoa and ground almonds.